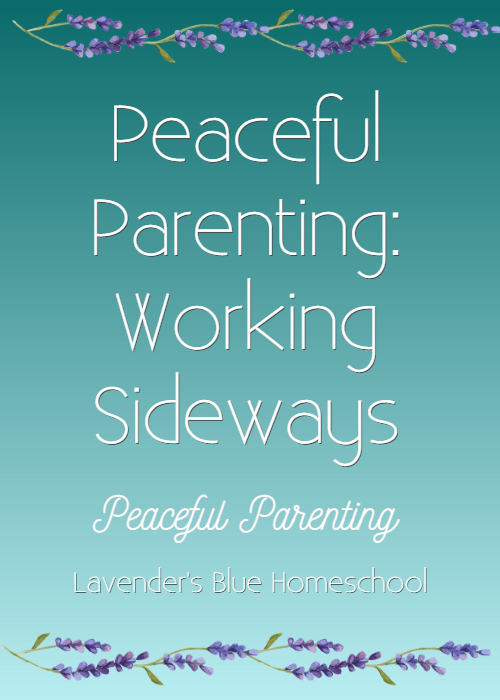 I've written a lot about peaceful parenting and how the major tools for discipline are pro-active rather than re-active. If you want to have a peaceful family life, the first steps are to work through connection, rhythm, environment, and imitation. But even while these tools are humming along, you will still need to set limits - and probably often! Sometimes it's necessary to tell a child directly what to do or not to do or what the expectations are. But often it's more effective to “work sideways” to address behaviors rather than head-on, especially with children under six. Young children often respond much better and learn faster when we keep the boundaries in a creative and playful way. So often parents feel they have two options: Ignore problem behaviors (and hope they will go away) or directly correct problem behaviors (and make them go away). But in many cases a third option is the most effective: Lead your child to the correct behavior by parenting sideways. "Mary wore her red dress, red dress, red dress..."
Singing is a great way to get a child's attention. They can often "hear" your words better when you sing them. There is something about singing which feels more gentle to a child and so they are less likely to dig in their heels or to have a big reaction to your request. I especially like to sing when I need to move something along (like getting dressed) or make a transition easier (like singing "Shoes on, shoes on, lights out, lights out, time to go to the park now....."). "I'd like to tell you a story. Once upon a time..."
Storytelling is a great way to stop any young child in his tracks! Say you're folding laundry and all hell is breaking loose - try calling out "I'd like to tell you a story!" and see what happens, or even better, start singing the song that you use when you are about to tell a story. Stories also carry messages, often in an indirect but powerful way. A story can be deeply therapeutic for a child even if it doesn't have a heavy-handed moral (see this book for more information). "Let's see how many hops you can do on the hop-on ball!" go outside where there aren’t any walls to bounce off of! Young children respond better to hearing what to do than what not to do. Often our first instinct if a child is hitting is to say “No hitting!” or “Don’t hit!” and this can actually be confusing to a toddler, who needs to be taught what to do in that situation. It works better to adopt a simple phrase like “Gentle hands” to repeat as often as necessary, while at the same time just calmly and confidently moving that toddler away from any situations where she is hitting. Over time she learns “I have gentle hands.” If it is time to take a bath, you can just calmly and confidently say “Bath time!” (and of course, even better to have a little song to sing when it’s bathtime!) and help your child move in that direction. Try to avoid escalating, raising your voice, threatening, making promises of rewards, punishing, or using if-than statements - it’s much more effective to just hold your own with a simple positive statement of the expectation. "Shy little bunny rabbits tiptoe quietly through the library! Shy little bunnies don't want to be heard!" Using language full of images and pictures speaks to the consciousness of your young child. He is living an imaginative life and when you join him there he can hear you better! "Great Mother Rain Cloud is blowing on her horn!" works much better than, "Oh, that's just thunder, it's nothing to be scared of." (That particular image comes from a wonderful story in the book Heaven on Earth - highly recommended!) Use images that will speak to your child (think about her favorite animals, for example, or stories that she loves). All of these approaches address problem behaviors (rather than ignoring them and hoping they will go away) but in a sideways, creative, and playful manner. And the amazing thing is that they promote a connected (and fun!) family life at the same time.